Alien: Blackout is the latest game in the Alien franchise. It’s similar to Five Nights at Freddy’s, I’m that you have to monitor different cameras to keep an eye out for the xenomorph. But on top of that, you also have to guide your crew members to different locations on the ship while keeping them and yourself safe. 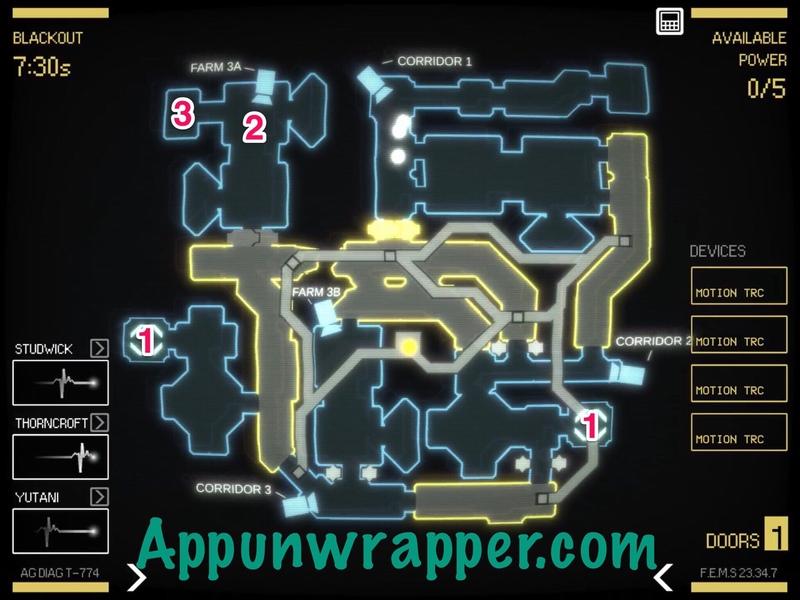 It’s not an easy game, but hopefully this walkthrough guide can help you survive. Feel free to ask for extra help in the comments section. See my Alien: Blackout review. 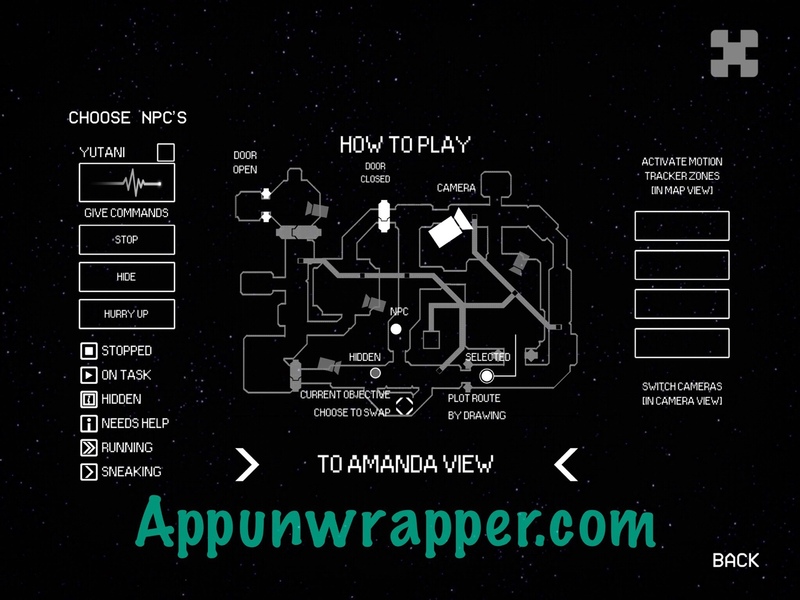 – Make sure to review the controls in case you missed any of them in the tutorial. – You need to direct your crew members by drawing a path for them, but it can be a bit fiddly sometimes. Try tapping them and then the area you want them to go to if the drawing isn’t working right. – Use the Motion Trackers to see when the alien is in a room. It will show up as a red dot. But you can’t see it when it’s in the vents or in a room without motion sensors. So there are a lot of blind spots. Using the motion trackers also uses power, so you could end up unable to close a door when you need to if you keep them on. – Open and close doors to keep the alien away from your crew members, and also make sure it doesn’t get to you in the vents/control room! – I recommend wearing headphones, because it’s the only surefire way to tell when the alien is in the vents and about to come at you. It gives you a warning so you can check and close the vent in time. – If there’s no door to block the alien, or you don’t have enough power to close it, try telling your crew members to hide until the alien moves on. – If you don’t see the alien near your crew members, it could be useful to tell them to hurry up. But if the alien shows up and they’re not in sneak mode, it’ll likely spot them more easily. – Keep an eye on your location as well, because the alien can come after you and then it’s game over! – You can pass a level as long as one crew member is still alive. But the game doesn’t tell you that if you let too many die off early one, you’ll be at somewhat of a disadvantage later. 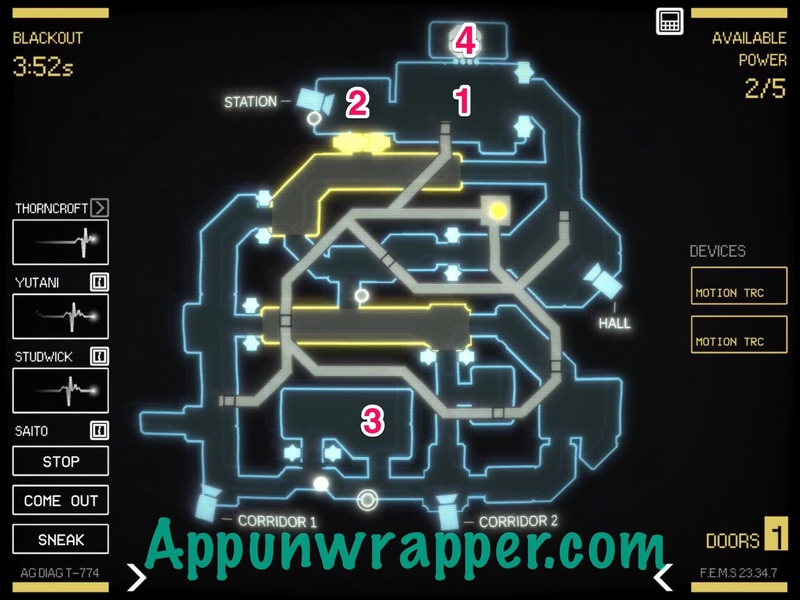 There are only four crew members and seven levels, so if three die by Level 3 or 4, you’ll only have one left for the rest of the game. So it may be worth it to repeat levels until you manage to keep everyone alive. There’s also achievements for keeping them all alive. Also, if you do let someone die, the rest of the crew will keep reminding you of it. – If you want to complete every level without anyone dying, make sure to restart a level before you complete it. Once you complete it, the game won’t let you retry and your only way of doing so would be to restart the whole game. – Hindsight is 20/20 in Alien: Blackout. You’re unlikely to succeed perfectly on your first try. But the information you get from it can help you on your next try. 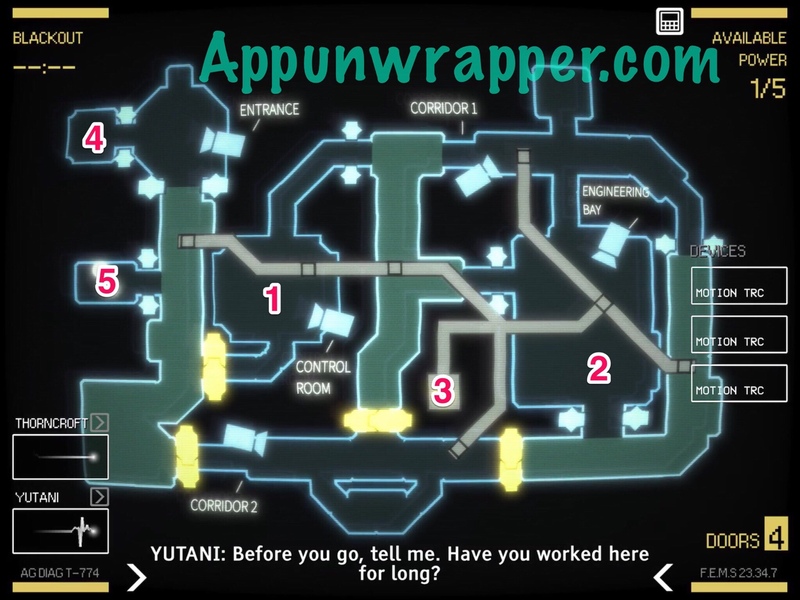 For instance, once you knew all the objective points for the level, including the exit, you can send crew members there before the objective pops up, saving valuable time. You can just have them hide out there till you need them for the objective. It feels both like cheating and also like it’s intended, so make of it what you will. I’m including maps and labeling the objectives for those who don’t want to bother with all this extra work themselves. This level is pretty easy, but it’s still possible to get someone killed. Here’s a map with all the objectives numbered so you can plan for them if you’re having trouble. 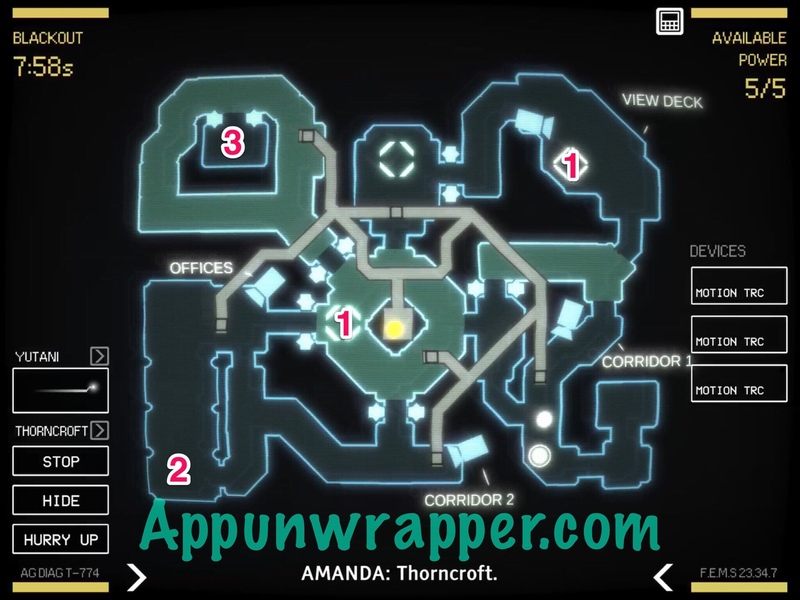 The one marked 3 is Amanda’s station, and you’ll have to close the vent door at that point so the alien doesn’t get her. I numbered the objectives on the map so you can plan for them. For the first two, you want to split your crew members up so you can get them at once. Ignore the third one on the screen at that point. Then once those two are clear, make your way for the one marked 2 with either one and then send both of them to 3. Here, you start with two crew members but the other two join you after the first objective is complete. You’ll need to get all four to the exit at the top, so it makes sense to send most of them that way as soon as possible. Only one objective is on the lower part of the screen, as the second one down there can be ignored. First, you need to cycle through the cameras so Amanda can locate the scrubbers. She’ll do so automatically once she sees them. Then, there are two objectives to reach at once. You can split up your party or send them to each altogether. Eventually, they’ll have to make their way up to Farm 3A, with the exit right next to it. The door will be locked to Farm 3A until you clear the other objectives first, but you can still send people in that general direction so they’ll be ready. Their are also two vent doors by Amanda this time, so use headphones to tell which side the alien is coming from. You need to rotate the camera to see the doors, though. Anyone playing THickety Creek? Easy, but I thought no there’s a glitch with playing the tune to open the toolbox. Anyone else having this problem? Anyone playing Thickety Creek? The correct tune on the tool box doesn’t work for me. I cannot complete the last level. Sometimes my one remaining crew member dies, sometimes I run out of time, but mostly the alien just keeps killing me. I din’t realize you were supposed to wear headphones. But does that still help when there are three vents the alien could be coming from? Thanks!! I’m gonna need it.